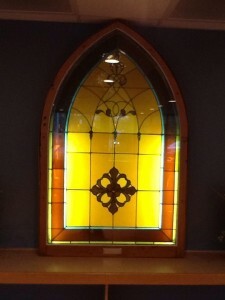 This stained glass window is from Westwood Baptist Church, built in 1895 (the predecessor to Faith Fellowship). Several Baptist families, led by Richard Gaines, settled in Cheviot in Green Township in the early 1800’s. The twenty-one-member congregation’s first worship service was May 27, 1821. On June 6, they elected officers and incorporated as a religious society according to Ohio law and became the Bethel Baptist Church. They met in homes and in a public log building until 1824 when they constructed a brick building on the site that is now the cemetery on Harrison Avenue. In May, 1895, the cornerstone of the first building on Cheviot Avenue was laid. The next notable date was September 10, 1936, when the church name became Westwood Baptist. The growing church added a Christian educational building to the church in 1948. On February 21, 1950, the church affiliated with the Conservative Baptist of America. In 1970, the church obtained permission to close off Darwin Avenue, allowing them to build a new sanctuary which was dedicated on October 13, 1974. In 1995, after portions of the 1895 building had to be closed, the church voted to purchase an 8.4 acre piece of land on the corner of Bridgetown and Powner Roads in an area experiencing considerable growth. Construction began with a ground breaking on April 18, 1999, and was completed in June of 2000. From 1821 to now, Faith Fellowship Church has had a rich tradition. It has been almost 200 years of seeking and following our Lord’s leading and proclaiming His Name!